There's no denying it: Crabs aren't the prettiest creatures and some of them are downright scary looking. Fortunately, even the biggest, most frightening looking crab isn't dangerous. You may suffer from a nasty pinch while you're swimming, which is normally harmless. If you're handling crabs, you're wise to wear gloves for protection. A crab's diet depends on what kind of crab he is. Some eat plants, while others are carnivores, preferring to eat minnows, snails and small shellfish. A carnivorous crab is no concern to you because human isn't in his dining repertoire. If you enjoy paddling about in the ocean, enjoy your swim knowing the crab isn't considering inviting you for supper. When you're swimming around in the ocean, you may feel a little pinch on your toe. Chances are, it's a crab giving you a warning pinch, letting you know you're in his way. If you've been crabbing and are sorting through your catch, once in a while a crab will latch on to your finger. Generally, a flick of the wrist will release him; if not, take him to water and he'll release himself. If your crabby encounter involves broken skin, such as a cut you got while you cleaned your crab, you should proceed with caution. People are at risk to develop blood poisoning or necrotizing fasciitis -- ghoulishly known as flesh eating bacteria -- if bacteria enters a wound from some seafood or seawater. In the rare chance a pinch does break the skin, or you get a cut on a sharp shell, thoroughly wash the wound. 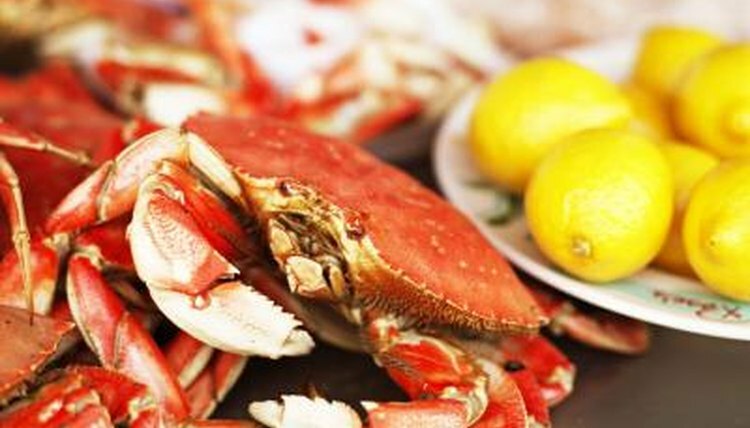 If you have existing wounds, wear gloves when you handle crabs and other seafood. The horseshoe crab certainly looks dangerous with his long spike. However, that long spike is actually a tale, used to upright himself if he gets turned upside down. The horseshoe crab isn't a crab at all, but more closely related to spiders and scorpions. The coconut crab isn't a true crab either, but is more closely related to a land hermit crab. This big guy can grow 3 feet long from the tip of one leg to another. You aren't in danger from this giant, but coconuts are; he can husk and open coconut shells to dine on the coconut's flesh. How Do Starfish Get Away From Their Predators? What Reptile Has Spikes on His Back?